I’ve done it! This is my first blog to appear on my website, something that has been on my to-do list for quite a long time. Yes it’s true, even I procrastinate, and blogging has been something I’ve wanted to do for a long time, but I wanted to be sure I could keep up with it and not put a few out followed by silence. So hello, and welcome to Cuppa with Carli, your excuse to make a cup of tea, pause your business, sit and read a blog, and hopefully get a few tips to improve your business or be more organised. So really, it’s still working. But without actually working. One of the benefits of re-organising my workload recently is that I can dedicate time to keeping my website, blog and social media up to date and really ensure things are ticking over nicely behind the scenes here at Synergy HQ. The other is that I have more time to myself, because I am not just my business, I’m also a wife to a hardworking husband, a mum to two young sons, and actually I’m just me too. I cannot count how many times I’ve heard from women who work for themselves, or run a small business, that they underestimated how much time is involved in everything that it takes to keep that business running and growing, on top of doing all the money earning work. Plus there are all the other things we need to keep on top of like running a home, perhaps looking after children, staying in touch with friends and family, and usually way down the list is taking care of ourselves. It’s crucial to keep up with the needs of your business, to keep it going and to enable it to grow; and while this might take the place of the lunches with friends or trips to the hairdresser that you imagined as a woman working for yourself, with some careful planning and scheduling you can indeed be the organised, efficient and successful business woman that you dreamed of in the early stages of your business. We all make time for the things that are truly important, but what about making the time for the things we want to do, too? 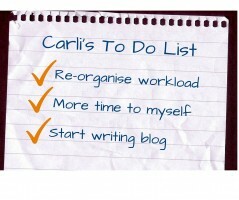 Look out for some of my upcoming blogs that will cover how to plan, schedule, and prioritise your workload, so that you can switch off sometimes and enjoy some time doing whatever else you’d rather be doing. For me, it’s spending time with my boys after school instead of working. A decent work/life balance is something we all strive for, yet not many people actively pursue this if it’s not happening the way they’d like it to. I wanted to create more time for myself and guess what? As the owner of the business, I can do just that. I’ve set my schedule to include time for the things I want to do outside of working, including things around the home and with my family. This is great, but I really need to make sure I keep on top of my workload and the running of the business in the most efficient way, as once that slips, then so does my ‘me-time’. I know exactly what I should be focussing on at work, and I will be walking the walk, not just talking the talk! I invite you to get yourself a cuppa, have a read of my blog posts, maybe find me over on Facebook or Twitter, and join me while I show women like you how to get more organised and less overwhelmed. Get yourself some honest and open advice on the things that will help your business run smoothly, create some simple systems that work for you (not give you more work to do), and make a positive difference to your business and your work/life balance. If you like the sound of re-organising your workload and having a more efficient schedule so you can spend more time growing your business or perhaps having some time off, book a free call and let’s have a chat about what you do, what you would like to achieve and work out the best way I can help you to achieve this.